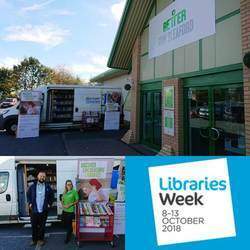 GLL – the social enterprise that’s also the UK’s largest provider of public libraries – has been throwing its weight behind National Libraries Week, 8-13 October. In the run up, many of GLL’s 130 libraries were re-imagined as ‘Fun Palaces’ (6-7 October) to get more people to visit their local library and find out what new, community-based and family-friendly activities are hosted there. From world language workshops to Black History, from still life drawing to mask-making and from yoga to dinosaurs – libraries hosted a plethora of fun activities for all ages. Operating libraries across Greenwich, Wandsworth, Bromley, Lincolnshire and Dudley, 2018 is the fifth year GLL has supported the national Fun Palaces project to get people to come together as a community to share skills for all ages in libraries, theatres and schools. National Libraries Week saw GLL open its doors to welcome customers old and new with a variety of events including author visits and presentations. GLL’s libraries are some of the most visited in the country with a professional and friendly staff, welcoming buildings, a strong stock selection, social activities and free wi fi. Following hard on the heels of Libraries Week comes Social Saturday (13 October) – the day when all social enterprises in the UK celebrate the £27bn contribution to the UK economy made by the not-for-profit sector. The Fun Palaces project is Co-Directed by author Stella Duffy and takes its inspiration from theatre director Joan Littlewood whose slogan ‘everyone an artist, everyone a scientist’ anticipated the social and technological changes the 21st Century was to bring. Nationally, the Fun Palace scheme has gone from 138 palaces, 3,183 makers and 40,000 participants in 2014 to 362 fun palaces 13,750 makers and 126,00 participants in 2017.